She Makes War | “Undone” – new single out now! Blog : “Undone” – new single out now! 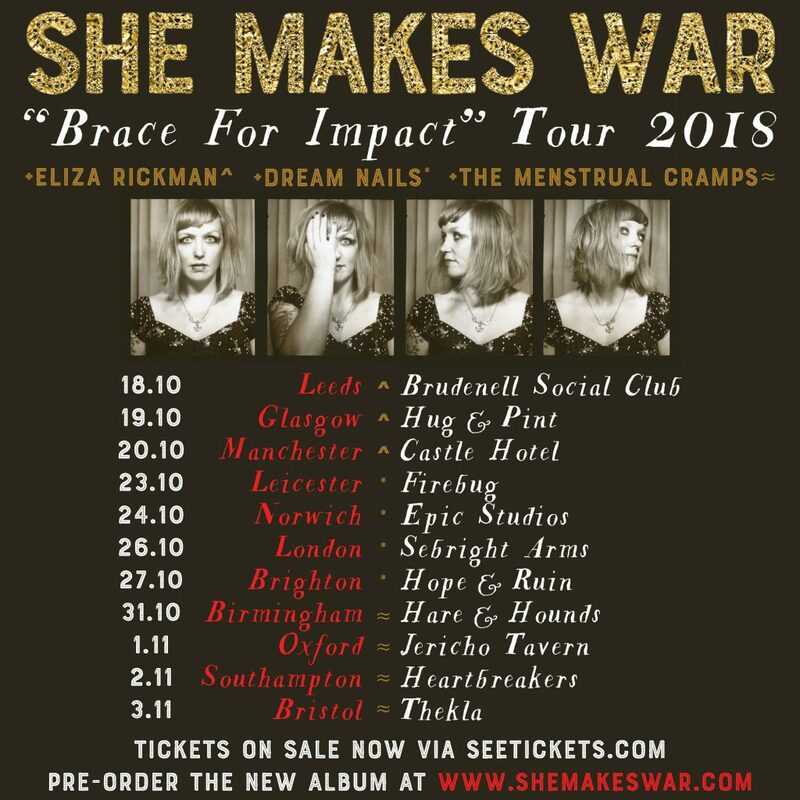 Bristol based producer and creative indie powerhouse She Makes War releases her new double A side single ‘Undone \ London Bites’, from forthcoming album ‘Brace For Impact’ (released 5th October). The songs will be made available online in two stages, with ‘Undone’ on 14th and ‘London Bites’ on 28th September. Analogue music fans are invited to order gorgeous hand packaged vinyl-effect CD singles direct from the artist via Bandcamp. Written in a daze the day after Laura’s grandmother Constance died last May, ‘Undone”s monster guitars deliver palpable rage at the bad things that happen to good people, the song acting as an openhearted rallying cry against the British stiff upper lip brigade. “We need to give ourselves a break”, she says. “Giving ourselves time to feel devastated doesn’t make us weak.” ‘I was told I feel things too much’, she sang on 2016’s “Paper Thin” (featuring guest vocals by Belly’s Tanya Donelly), but with age, experience and the bitter state of the world comes confirmation empathy should be treasured as a rare strength. Meanwhile, the deliciously brooding ‘London Bites’ details Laura’s move to London aged 18 and the sorry realisation the people you hold close don’t always have your best interests at heart. Informed by her first boyfriend she couldn’t – and shouldn’t – sing, Laura sends wise survival tips back in time to embolden her younger self to dream as big as the potential of London’s gold-paved streets. “Hold your head high / pull your lips wide / make your mind keen / keep your teeth clean” – words to live by. Album “Brace For Impact” is dedicated to both of Laura’s brilliant grandmothers, Constance and Julia, with thanks for always encouraging adventure.